Honest talk: I’ve been feeling pretty void of inspiration in the kitchen lately. These times come and go, I know this. But when you’re in the thick of it and you can’t even decide what your rumbly tumbly is telling you to make for dinner and you or may or may not resort to a box of mac and cheese, you know it’s bad. Sigh. 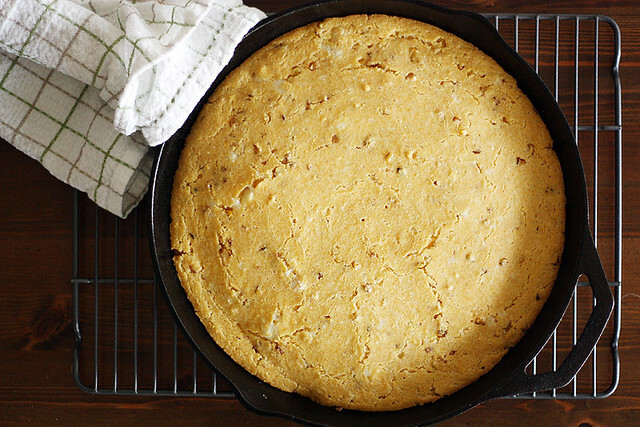 Thankfully, this skillet cornbread was created during the opposite of those times. So I have a theory that if I just keep making it again and again, my inspiration will return (or at the very least, my tummy will be full in the meantime). I actually first made this cornbread this summer as part of a project with the good folks at Old El Paso, when fresh corn on the cob was EVERYWHERE. Now? It may be a bit difficult to find, but if you have any luck of tracking it down, I suggest you get a few ears and make this bread soonest. (And if you can’t find the cobs? Canned corn will do just as well.) In any case, I’m super pumped to share the recipe with you today. 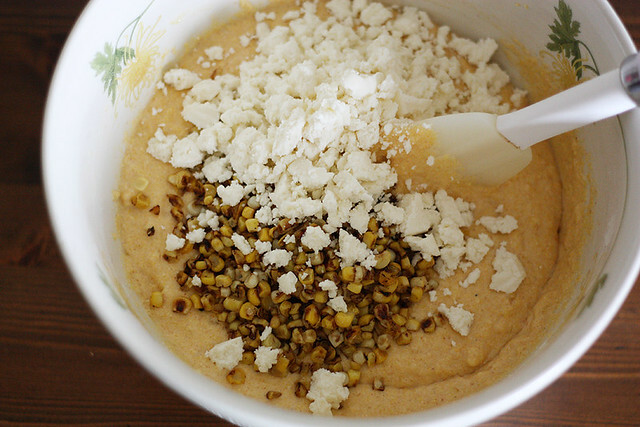 It tastes like a buttery-cornbread-Mexican-corn-on-the-cob (a.k.a. “elote”) hybrid, and it’s a bread baked in a skillet which, as you well know by now, is a great way to do things. Also, I threw some cheese into the batter so there are bits of that in the bread, as well. You’re welcome. This cornbread has a little added chutzpah to it thanks to the taco seasoning, lime juice, charred corn and above-mentioned cheese. I like to serve it with extra lime wedges if you’re mega-into the citrus thing, but it’s not necessary. The bread stands on its own. Though I do highly recommend serving it up with a big bowl of chili on a cool, cozy night. Inspiration, come back quickly. Until then, I’ll be over here happily munching on the umpteenth slice of this bread. P.S. I’m sad to say that I’ll be taking a hiatus for now on the videos because, as my dad often says (and we often lovingly make fun of him for), of “various different things.” But I’ll be sure to keep you posted on their return! 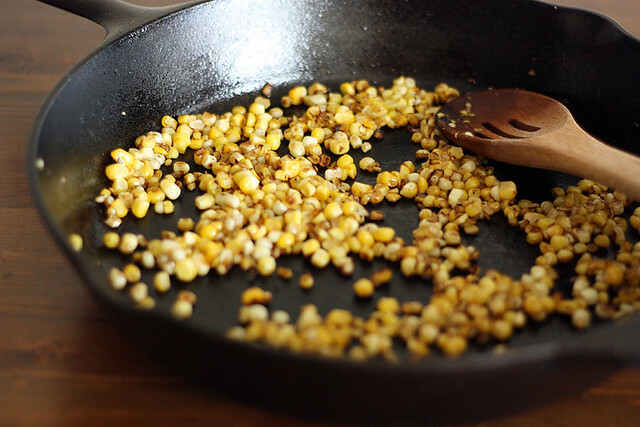 Heat a small amount of oil in a large, cast-iron skillet over medium-high heat; add corn kernels and cook, stirring occasionally, until charred, about 5 to 7 minutes. Remove from heat and set aside. Heat oven to 350°F. Combine milk and lime juice in a measuring cup; let sit 5 minutes. 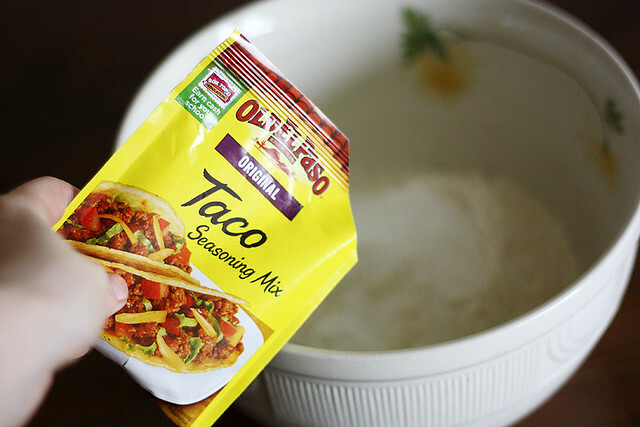 In a large bowl, whisk together flour, cornmeal, sugar, baking powder, taco seasoning and salt. In a separate medium bowl, whisk together butter and eggs. Add milk and stir to combine. Stir wet ingredients into dry ingredients until just combined. Fold in charred corn and crumbled cheese. Let mixture sit 10 minutes. Butter the bottom and sides of cast-iron skillet. When batter is rested, pour into prepared skillet. Bake until a toothpick inserted in the center comes out clean, about 30 minutes. Remove from oven; cool 15 minutes before slicing. Serve with lime wedges, if desired. Isn’t skillet cornbread the best?! This sounds awesome! Oh I love this! My boys would love this! I am definitely making this! We do quick elote in a skillet by combining canned corn, mayo, butter, queso fresco and a dash of chili powder on top. Oh lordy, does this look delicious! I have a weakness for any recipe that has any sort of Mexican flavoring. Yum! I love corn bread. I discovered this love when I could not eat much solids and need something for soup. I love the idea of roasting the corn in pan before hand and addition of taco seasoning? Genius! The simple bread bakes are sometimes the best. Lookit that cheese and corn! Chutzpah it up, lady, this cornbread’s amazing! Charred corn, cheese, lime and carbs…..heck, yes!! So making this with my next batch of chili. I know just how you feel about being uninspired. I’ve been a victim of that too, lately. It’s great to have easy and delicious dishes like this cornbread in your arsenal to get you through without ODing on mac & cheese. In my book, cornbread always hits the spot! I sometimes feel that way–and then all of a sudden am full of ideas that I don’t have nearly enough time to execute (that’s what a notepad is for, but I tend to forget that type of thing). These cornbread is perfection! Love the addition of cheese, you never go wrong with that. 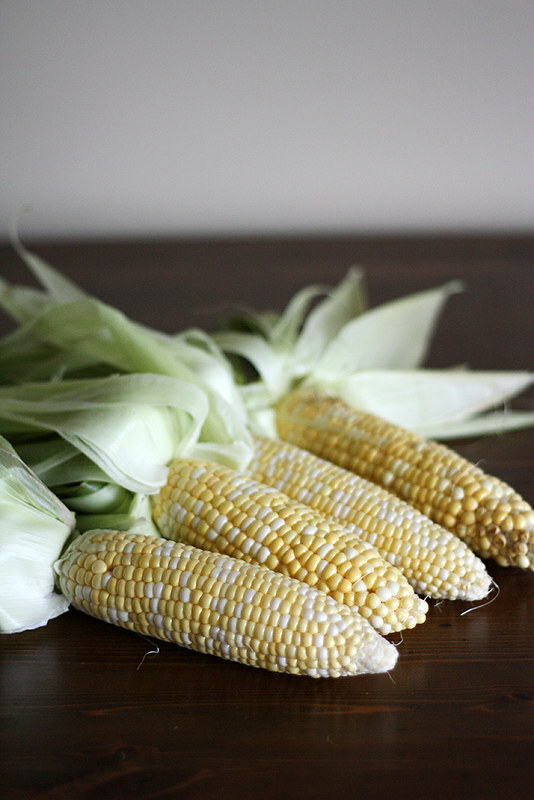 I’m OBSESSED with Mexican corn like this and to turn it into cornbread is genius. Going to make this with some chili very very soon! This cornbread is callin my name sista.. That and a bowl of chili..
And I hear you on the lack-of-kitchen-inspiration. I went through that with everything other than canning recipes in August. What helps me, when I’m feeling “stuck” is to pick a particular theme or ingredient, and brainstorm for 10 minutes. I just write down every single idea I can think of using that theme/ingredient, even if I’ve made it before or it sounds weird…just something to get the thoughts brewing again! Please sign me up for that entire skillet! Big cornbread fan here! Fun little twist to what can be an otherwise “yawn” recipe. Like it! Oh baby! I love elote!!!! Next week it is supposed to be in the 50’s here, so that would be a perfect day for this and a big bowl of chili!!!! I cannot wait! 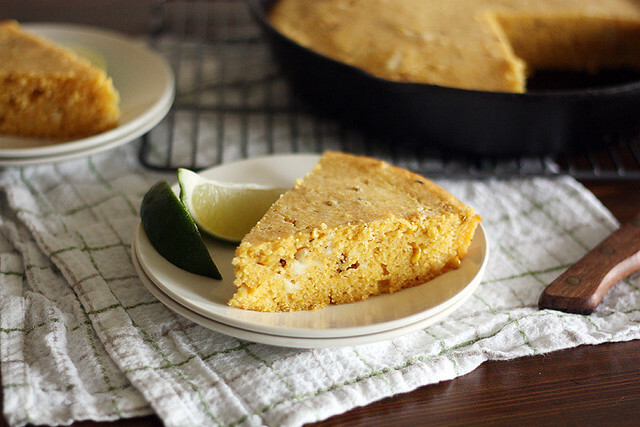 Love the fresh corn and cheese in this cornbread! So good! I have been feeling the same way lately, girl. I got your back on this one. And boxed mac and cheese…sometimes you just gotta go with the blue box. I mean, truth. I for one find this corn bread to be totes inspirational – because *gasp* I’ve never made cornbread from scratch before! I know! So I am alllll over this! Oh giiiiiiirl! This has stolen my heart! Now this is how you do cornbread – LOVE this recipe!! recipe looks great! will have to try! Sorry about your inspiration! Hope you get your mojo back soon! Now this cornbread – loving it! 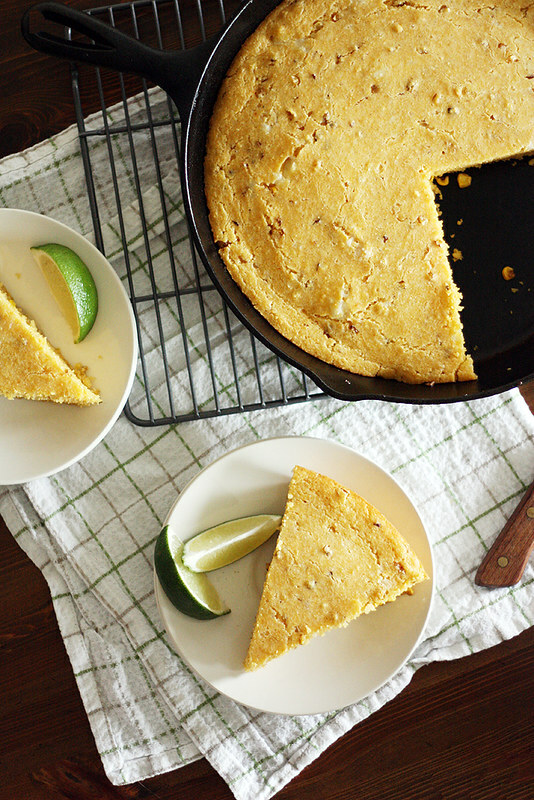 I’m such a sucker for cornbread – I’m sure I could eat the entire skillet clean! Oh yum, this looks so good! I love me some corn bread. The actual fresh corn must add such great flavor, and of course, I’m always a supporter of cheese!